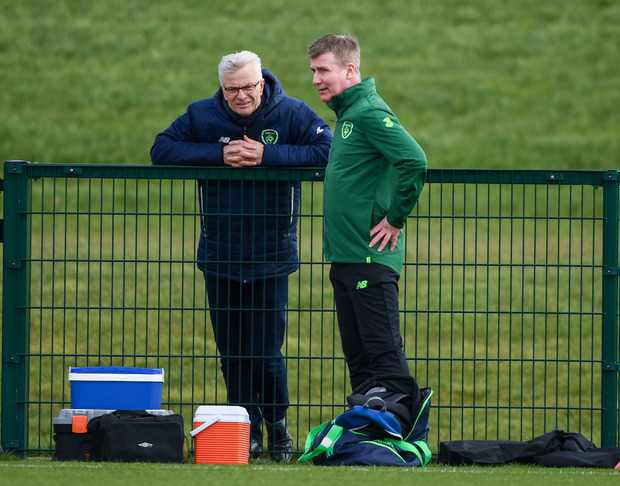 Ireland U21 manager Stephen Kenny has been rocked by another withdrawal after losing Norwich City winger Simon Power - currently on loan at Dutch second division side Dordrecht – with a calf injury. He has called in Shamrock Rovers midfielder Brandon Kavanagh who becomes the third Rovers player to be drafted for international duty this week, following Jack Byrne's late call-up to the senior squad. Trevor Clarke is already with the U21 side. Kenny's side face Luxembourg in Tallaght this Sunday in the opening match of their European Championship qualifying campaign and he has already lost Southampton starlet Michael Obafemi, as well as Spurs' striker Troy Parrott and Aaron Connolly. "We scanned it and it is a grade one tear so he'll be out for a while," said Kenny of Power's injury. "We're in discussions with Norwich. "I have faith in the players we have. It's great to be in and have a few days training. It's a great opportunity. "We've promoted five players from the U19s and some from U18s so they haven't all played with each other before. And we have players who have never been capped. We're trying to formulate a team for Sunday." Rovers' league game with Finn Harps this Friday will go ahead despite losing three players to the international squads.